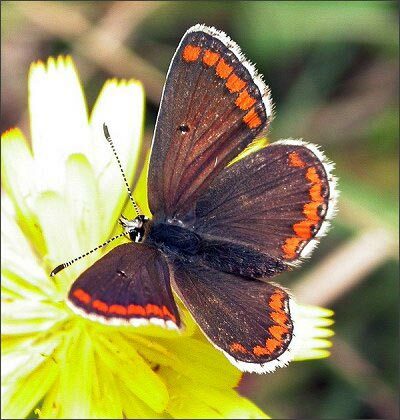 Special features: The upper surface of the wings are dark brown with a row of orange half-moons all around the edges and a narrow white border. There in a black spot in the centre of each forewing. The bright green caterpillars are about 10mm long, with a faint white line running along its sides. Distribution: Found mainly in the south and up to the Midlands of England. Also in some parts of north and south Wales. Months seen: May to September. Habitat: Meadows, downs, dunes and cliffs. Food: Caterpillars feed on rock rose and stork's-bill.